Objectives Chondroitin sulfate 800 mg/day (CS) pharmaceutical-grade in the management of symptomatic knee osteoarthritis consistent with the European Medicines Agency guideline. Methods A prospective, randomised, 6-month, 3-arm, double-blind, double-dummy, placebo and celecoxib (200 mg/day)-controlled trial assessing changes in pain on a Visual Analogue Scale (VAS) and in the Lequesne Index (LI) as coprimary endpoints. Minimal-Clinically Important Improvement (MCII), Patient-Acceptable Symptoms State (PASS) were used as secondary endpoints. Results 604 patients (knee osteoarthritis) diagnosed according to American College of Rheumalogy (ACR) criteria, recruited in five European countries and followed for 182 days. CS and celecoxib showed a greater significant reduction in pain and LI than placebo. In the intention-to-treat (ITT) population, pain reduction in VAS at day 182 in the CS group (−42.6 mm) and in celecoxib group (−39.5 mm) was significantly greater than the placebo group (−33.3 mm) (p=0.001 for CS and p=0.009 for celecoxib), while no difference observed between CS and celecoxib. Similar trend for the LI, as reduction in this metric in the CS group (−4.7) and celecoxib group (−4.6) was significantly greater than the placebo group (−3.7) (p=0.023 for CS and p=0.015 for celecoxib), no difference was observed between CS and celecoxib. Both secondary endpoints (MCII and PASS) at day 182 improved significantly in the CS and celecoxib groups. All treatments demonstrated excellent safety profiles. Conclusion A 800 mg/day pharmaceutical-grade CS is superior to placebo and similar to celecoxib in reducing pain and improving function over 6 months in symptomatic knee osteoarthritis (OA) patients. This formulation of CS should be considered a first-line treatment in the medical management of knee OA. Another potential source of inconsistency in the results from previous studies of SYSADOAs in knee OA has been idiosyncratic trial design. For this reason, the European Medicines Agency (EMA) produced a Guideline on Clinical Investigation of Medicinal Products Used in the Treatment of Osteoarthritis (CPMP/EWP/784/97 Rev. 1), guideline which has been recently supported by a European experts consensus.22 It recommends that efficacy of chemical entities used in the treatment of symptomatic OA be tested according to a standard study design with the following basic parameters: a minimum 6-month study duration; a three-arm study design including a placebo and an active comparator (ie, oral NSAID); and two co-primary endpoints evaluating pain and function, respectively. Herein, we report results from a study of pharmaceutical-grade CS in patients with symptomatic knee OA, which, to our knowledge, is the first ever to have been conducted in full accordance with the aforementioned EMA guideline. The study comprised patients from Belgium, Czech Republic, Italy, Poland and Switzerland, who were enrolled between June 2014 and October 2015. The main inclusion criteria were outpatients status, age above 50 years and primary knee OA of the medial or lateral femorotibial compartment diagnosed according to the clinical and radiographic criteria of the American College of Rheumatology (ACR).23 The more symptomatic knee (with a pain score of at least 50 mm on a 0–100 mm Visual Analogue Scale (VAS) for at least 3 months before enrolment) was defined as the target knee. The main exclusion criteria were those listed in the last version of the Guideline on Clinical Investigation of Medicinal Products used in the Treatment of Osteoarthritis released by the EMA in 2010 (CPMP/EWP/784/97 Rev. 1) and grade 4 radiographic OA according to the Kellgren-Lawrence (K-L) grading system.24 Use of any intra-articular injection in the target knee in the last 6 months, SYSADOAs in the last 3 months, NSAIDs in the last 5 days and paracetamol in the 10 hours preceding enrollment was also specifically forbidden by the study protocol. There were two co-primary endpoints, predefined as stipulated by the EMA guidelines: pain and Lequesne Index (LI) assessment. Ethics Committee approval from all participating centres was obtained and all patients gave their written informed consent to participate. This study has been designed to assess the symptomatic effect of CS. Bone and cartilage markers were not the target in this short study. Patients were randomly assigned to one of the following three groups: (1) Group CS: one tablet of CS 800 mg and one capsule of placebo celecoxib; (2) Group celecoxib: one tablet of placebo CS and one capsule of celecoxib 200 mg (Celebrex Pfizer); (3) Group placebo: one tablet of placebo CS and one capsule of placebo celecoxib. The tablets of Celebrex available on the market were encapsulated to allow for a double-blind, double-dummy design. CS tablets contained highly purified chondroitin 4 & 6 sulfate in a concentration not less than 95% (European patents E 1582214 and EP 1705192) (Condrosulf (other brand name: Chondrosulf, Condral) 800; IBSA Institut Biochimique SA; Pambio-Noranco, Switzerland). All treatments were taken once daily, every evening with a glass of water, for 6 months. For rescue analgesia, patients were allowed to take paracetamol 500 mg tablets (maximum dosage 3 g/day), and they recorded use thereof in a diary. An appropriate washout period of 10 hours was required before symptom assessment at in-clinic visits. No other pharmacological or non-pharmacological interventions for OA were allowed. Compliance with the study treatments was established by asking the patients about missing doses and by counting unused study drugs. There were two co-primary endpoints, as stipulated by the EMA guideline, and both were assessed as the change from baseline, that is, the difference between enrollment and study conclusion. One endpoint was the patient’s estimate of pain on a 100 mm Visual Analogue Scale (VAS). The other endpoint was the Lequesne Index (LI), which integrates pain and function and results in a score from 0 to 24.25 Secondary endpoints included the proportion of patients reaching the Minimal-Clinically Important Improvement (MCII), defined as the smallest change in measurement that signifies an important improvement in a patient’s symptom,26 and the Patient Acceptable Symptom State (PASS), defined as the value of symptoms beyond which patients consider themselves well.27 Patient and investigator global assessment were scored on a 5-point Likert ordinal scale (excellent, good, fair, poor, none). All adverse events and abnormal laboratory test results were recorded. All statistical analyses were performed using SAS Software (V. 9.4 and V. 8.2) on a Windows 7 operating system. We calculated a sample size of 600 patients based on an estimated difference of 9 mm between CS and placebo after 6 months of treatment, with a standard deviation (SD) of 25 mm, a power of 90%, an alpha risk of 5% and a drop-out rate of 15%. The intention-to-treat (ITT) population was defined as all randomised patients who received one dose of the study medication. Safety analyses were conducted on all randomised patients. VAS (pain in mm) and LI score from D1 to D182 were compared between the three treatment groups by means of a linear mixed model carried out by using the SAS MIXED procedure, with patient as random effect, centre, treatment group, time point, interaction between treatment group and time point as categorical covariates (interaction between treatment group and centre excluded from the final models because not statistically significant. p=0.101 for VAS mixed model, p=0.998 for LI mixed model). No missing values replacement (LOCF, last observation carried forward or BOCF, basal observation carried forward) was performed for this analysis. The proportion of patients reaching the MCII, the PASS and the Outcome Measures in Rheumatology (OMERACT-OARSI) criteria were compared using a Chi-square (χ2)) test. Patient’s and investigator’s global assessments were analysed by means of Mantel-Haenszel χ2 test. Differences between groups in rates of patients with treatment-emergent adverse events (TEAEs), serious adverse events (SAEs), adverse drug reactions (ADRs) and study withdrawals due to AEs were assessed using the χ2 test. Of 656 patients screened, 604 were randomised and 603 considered eligible for ITT analysis (all patients who received the study medication). Of these patients, 199 received CS, 199 received celecoxib and 205 received placebo. The cumulative time distribution of withdrawals was similar in the three groups without significant differences in reasons for withdrawals (figure 1). Patients in the three groups had similar demographic and baseline characteristics (table 1). Grades 1 to 3 of K-L were equally distributed between the three groups, with roughly 50% of the patients presenting a grade 2 OA and 25% corresponding to either a grade 1 or a grade 3 overall. Disposition of patients. AE, adverse events. Analysis of pain scores in ITT revealed a significant improvement in all three groups compared with baseline at day 30, 91 and 182 (all p<0.001) (figure 2). 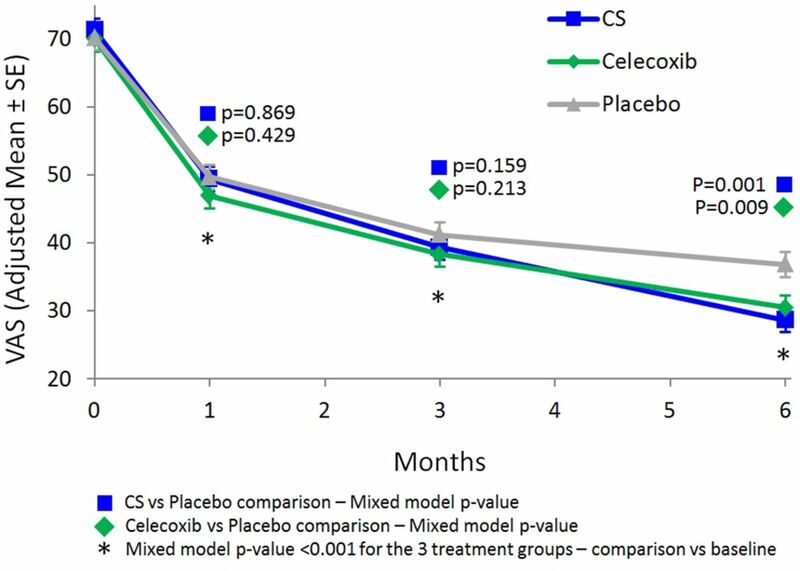 Both the CS and the celecoxib group showed a statistically greater reduction in pain compared with the placebo group (p=0.001 for CS and p=0.009 for celecoxib, table 2) after 6 months without any significant difference between the two active groups (p=0.446). Analysis of LI scores in ITT revealed a significant amelioration in all three groups compared with baseline at day 30, 91 and 182 (all p<0.001) (figure 3). At day 91 and 182, both CS and celecoxib induced a significantly greater reduction in LI than placebo (p=0.050 for CS and p=0.027 for celecoxib at day 91, p=0.023 for CS and p=0.015 for celecoxib at day 182) while no difference was observed between CS and celecoxib (p=0.799 at day 91 and p=0.890 at day 182, table 2). The decrease in LI observed in the celecoxib group attained statistical significance in comparison to the placebo group at day 30 (p=0.045), while it took the CS group until day 91 (p=0.050) (figure 3). After 6 months, a greater proportion of patients reached the MCII (20 mm of VAS reduction) in the CS (68%) and celecoxib (69%) groups than in the placebo group (61%). This difference was not significant for the CS–placebo comparison (p=0.122), for the celecoxib–placebo comparison (p=0.098) and not significant for CS–celecoxib comparison (p=0.914). Similar results were obtained for the proportion of patients reaching the PASS in the CS (57%), celecoxib (59%) and placebo (49%) groups. The PASS data were significant for the celecoxib–placebo comparison (p=0.047), not significant for the CS–placebo comparison (p=0.130) and not significant for the CS–celecoxib comparison (p=0.611). Significant results were observed when defining responders patients with at least 40% or 50% of improvement in pain or LI scores, and when patients were classified according to OMERACT-OARSI (scenario F). CS and celecoxib provided significantly higher number of responders than placebo and no difference was observed between CS and celecoxib (table 3). At study conclusion (day 182), significantly more patients and more investigators scored the global assessment as excellent or good in the CS and celecoxib groups compared with the placebo (p=0.027 for CS, p=0.013 for celecoxib), while there was no difference between the two active groups (p=0.774). Study medication usage was >95% in all groups, demonstrating excellent compliance and the absence of intergroup differences. Finally, there was no significant difference between CS, celecoxib or placebo usage in the rate of TEAEs, SAEs, ADRs and withdrawal related to TEAEs. Abdominal pain/discomfort was the most frequently reported ADR (2.5% in the CS group, 4.5% in the celecoxib group and 2.9% in the placebo group). Routine laboratory testing identified one case of leukopenia and one case of thrombocytopenia in the placebo group, but no significant abnormalities in the CS or celecoxib groups. In this report, we provide data from the CONCEPT trial, which, to our knowledge, is the first-ever evidence supporting a durable therapeutic benefit of SYSADOAs in a knee OA clinical trial that is fully aligned with the current EMA guideline. We demonstrated that CS is superior to placebo and similar to celecoxib across multiple outcome measures, including reduction in pain and LI (co-primary endpoints), as well as in the proportion of patients experiencing MCII (secondary endpoint) and patient/investigator global assessments. All treatments, including placebo, provided a statistically significant improvement from baseline on pain and function as early as day 30, and this effect persisted until the end of the trial. This is not surprising as a substantial placebo effect was previously reported in trials assessing drugs in OA.29 30 However, both active groups (CS and celecoxib) provided a significantly greater reduction in pain (VAS) and a better improvement in function (LI) than the placebo, after 6 months and 3 months, respectively. 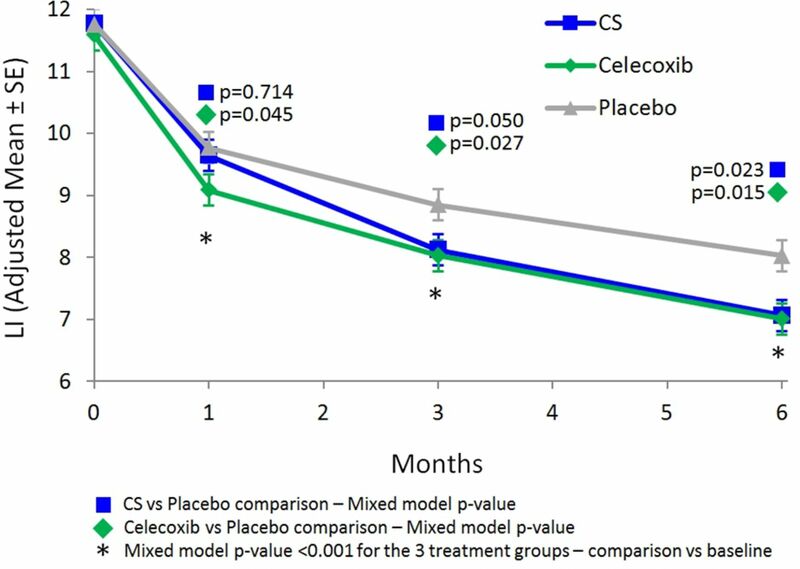 With respect to LI, it is interesting to note that celecoxib treatment resulted in a statistically significant change at day 30 compared with placebo, while CS did not. Although impossible to know definitively, this observation may be related to an intrinsic difference in the mechanism of action of the two molecules. 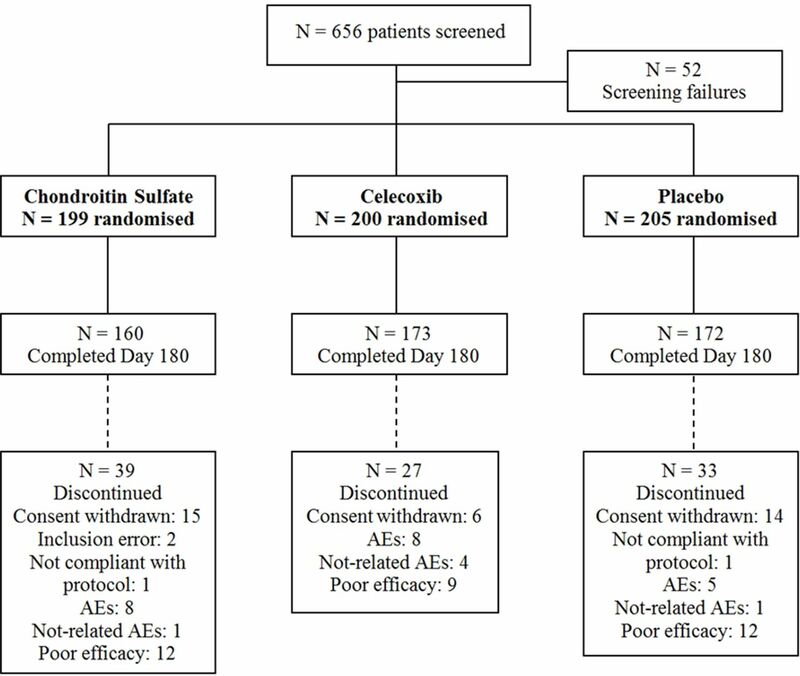 Although both acetaminophen and NSAIDs have been shown to be efficacious in the setting of knee OA, the chronic use of these medicines is known to be associated with frequent and serious adverse events.13 14 It is notable in this regard, that CS, in addition to a robust efficacy profile that is comparable to NSAIDs, also exhibits a safety profile that was similar to placebo in this study and in others.5 8 16 17 21 This combination of therapeutic effect and well-documented safety and tolerability explain why recent guidelines8 9 recommend SYSADOAs, including pharmaceutical-grade CS, as a first-line treatment in the management of knee OA. In addition to the classic efficacy parameters, pain and LI, regulatory and clinical guidelines continue to place additional emphasis on patient’s perception of their clinical status, thus requiring the use of additional measures to assess treatment outcome. The significantly higher proportion of patients reaching the self-assessed MCII and the significantly greater number of patients ranking their treatment as good or excellent, compared with the placebo group, further reflects the importance of clinical benefits obtained with CS usage. In conclusion, the CONCEPT study provided evidence that daily administration of 800 mg of 4 &6 CS in patients with symptomatic knee OA lead to improvement in pain and function superior to placebo and similar to the NSAID celecoxib. In addition, we confirmed the excellent safety profile of CS that has been previously observed by others. This compelling benefit-risk profile, in light of the known clinical risks associated with chronic usage of NSAIDs and paracetamol, underscores the potential importance of pharmaceutical-grade CS in the management of knee OA, especially in this older population requiring long-term treatment. More generally, this study corroborates the need for future clinical guidelines on the pharmacological management of knee OA to consider the study design, as well as the composition and quality of the test product, when assessing the effectiveness of SYSADOAs. The authors thank all the investigators of the CONCEPT STUDY: Michael Gengenbacher, Bethesda-Spital, 4052 Basel, Switzerland. Diana P. Frey, Universitatsspital Zurich, Rheumaklinik, Zurich, Switzerland. Marco Matucci Cerinic, Dipartimento di Medicina Interna, Sezione di Reumatologia, Scuola di Spec. In Reumatologia, Unità Operativa di Medicina Interna I e Reumatologia, Azienda Osp. Univ. Di Careggi, Villa Monna Tessa, Firenze, Italy. Radosław Górski, Medica Pro Familia, Warszawa, Poland. Rafał Plebański, Klinika Zdrowej Kości, Łódź, Poland. Jerzy Supronik, Zdrowie Osteo-Medic, Białystok, Poland. Zbigniew Żęgota, SOLB, Ostróda, Poland. Petr Kopsa, Thomayerova nemocnice- Revmatologické a rehabilitačné oddělení, Vídeňská 800, Praha, Czech Republic. Jaroslava Spěváková, Interní a revmatologická ordinace, Břeclav, Czech Republic. Zbyněk Maška, Ortopedická Ambulance, Brno, Czech Republic. Eva Dokoupilová, MEDICAL PLUS, s.r.o., Revmatologická ambulance, Uherské Hradište, Czech Republic. Libor Novosad, Vesalion s.r.o., Ostrava, Czech Republic. The authors thank Giuseppe Mautone and Arturo Lanzarotti, IBSA, Institut Biochimique SA, Via del Piano, 6915 Pambio-Noranco, Switzerland.
. Development of criteria for the classification and reporting of osteoarthritis. classification of osteoarthritis of the knee. diagnostic and therapeutic criteria committee of the american rheumatism association. Arthritis Rheum 1986;29:1039–49.
. The algofunctional indices for hip and knee osteoarthritis. J Rheumatol 1997;24:779–81.
. Fernandes Moca Trevisani V. Diacerein for osteoarthritis. Cochrane Database Syst Rev 2014;2:CD005117.
. Statistical power analysis for the behavioural sciences. 2nd Ed. Hillsdale, NJ: Lawrence Earlbaum Associates, 1988. Disclaimer: This is a summary of a scientific article written by a medical professional (“the Original Article”). The Summary is written to assist non medically trained readers to understand general points of the Original Article. It is supplied “as is” without any warranty. You should note that the Original Article (and Summary) may not be fully relevant nor accurate as medical science is constantly changing and errors can occur. It is therefore very important that readers not rely on the content in the Summary and consult their medical professionals for all aspects of their health care and only rely on the Summary if directed to do so by their medical professional. Please view our full Website Terms and Conditions. Copyright © 2017 BMJ Publishing Group Ltd & European League Against Rheumatism. Medical professionals may print copies for their and their patients and students non commercial use. Other individuals may print a single copy for their personal, non commercial use. For other uses please contact our Rights and Licensing Team. Contributors All authors agreed to correct the manuscript as per the reviewers recommendations. Funding The study was sponsored by IBSA Institut Biochimique SA, Pambio- Noranco, Switzerland, a pharmaceutical company marketing Chondroitin Sulfate. The manuscript was entirely written by the first Author (JYR) who received an editorial assistance from IBSA. However, IBSA has no influence on the content of the manuscript. The editorial assistance was limited to the final editing of the manuscript and the submission process through the ARD website. Ethics approval Belgium, Italy, Switzerland, Czech Republic, Poland.